I met Bob Blumer, the Surreal Gourmet. Calm down people, calm down! I know you are excited at the sight of your favourite chef! I’m going to be frank, I didn’t have any idea who Bob is when I received the invitation from Discovery Travel & Living, well the name sounds familiar and I know he’s a celebrity chef. It was only when my friends went gushing over, “his toaster van.. “, then I remember seeing his show before. I didn’t really notice the chef’s name back then, but I definitely do now. And I’m not about to go, “oh Bob you know I love the episode where you ran a marathon and drank twenty one wine in France..” The idea is simple enough, Bob’s in town, and he wants food, the local Singapore food! So the group of us (media and bloggers) had the pleasure to bring Bob exploring some of the places in the East. Our first stop was at Kway Guan Huat, for Popiahs! I’m really excited about this because I’ve been craving for popiahs, and here, they do all their popiah skins by hand. It sure wasn’t easy to do so, Bob had some fun trying to do the popiah skin, and learning to wrap a perfect popiah from Zita, the owner. Benjamin (Mr. Miyagi) took a cool video of the whole popiah-making process too! 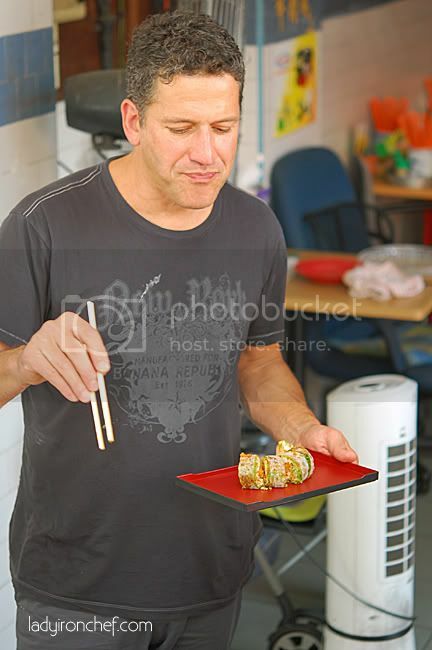 Bob eating his very delicious popiah, which he would gladly pay ten bucks per roll! 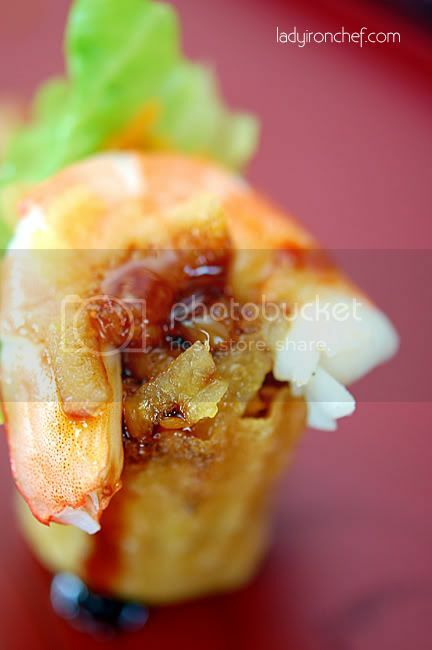 We had the premium roll which had more ingredients; lots of vegetables, and of course our orders were “special” so we had extra shrimps too! The popiah at Kway Guan Huat is Nonya style, I couldn’t exactly remember all the ingredients; but there’s omelette, garlic, turnip, and lots of greens. But I actually preferred the kueh pie tee to the popiah! 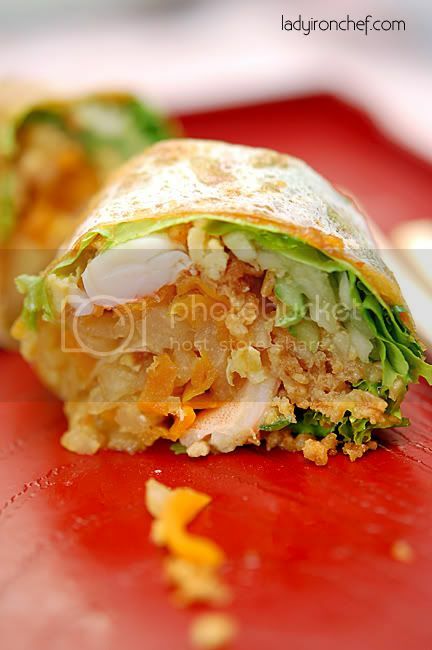 It was awesome; using about the same ingredients, they were placed within the crunchy shells instead of the soft popiah skins. And I finished it, in a bite, or at least I tried to! There was some time while waiting for the food to be served at our second stop, Old Mother Hen, so we hopped across the street and look at the local fruit stalls. The folks at Old Mother Hen were indeed good hosts, the big table was filled up with so many dishes! 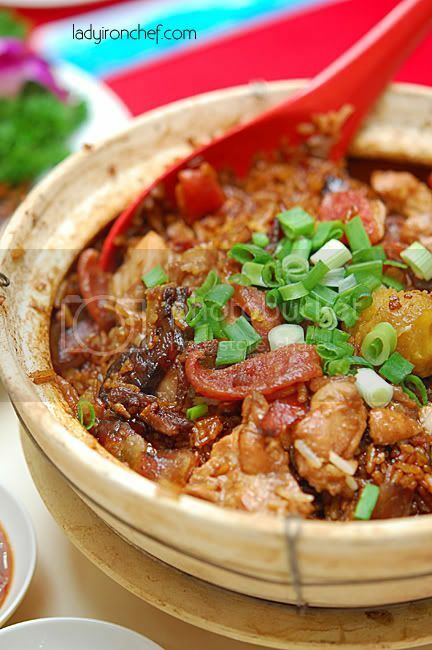 We tried a bit of everything, but my favourite was definitely their claypot rice! And despite knowing there’s more food after this, I couldn’t stop myself from having more helpings of the rice. 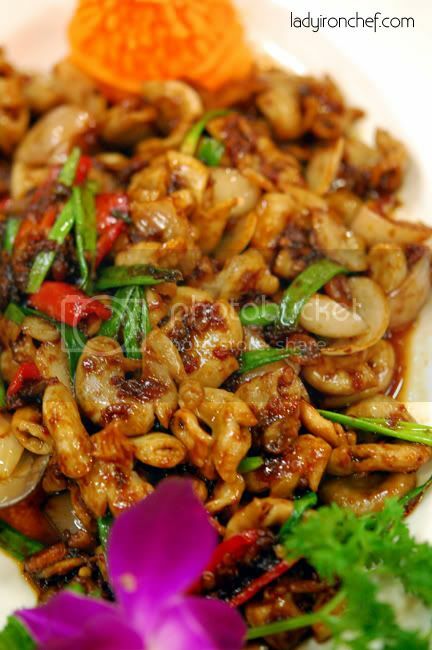 This was the stir fried fallopian tubes that got everybody attention. We also had KL style black Hokkien mee, the very good home-made beancurd, claypot frog legs, herbal kampong chicken, and steamed shark’s head. Our last stop was supposed to be trying out three katong laksa and let Bob determine which is his “favourite authetic” one, but due to some unforeseen reasons, we ended up at Seng Kee for bak chor mee (minced pork noodles) instead. We wished there was more time for us to try out more places, but Bob had a busy schedule during his short stay here so our tour ended here. It was really cool to chat with Bob and hang out with the other bloggers for the day. We had fun chatting on the mini-bus (no toaster van) while moving from point to point, busy snapping photographs of food, and of course enjoying the food with great company! My appreciation to Priya and Rita of Weber Shandwick, and to Discovery Travel and Living for the invitation. Glutton for Punishment 3 premieres Thursday at 2230hrs starting July 23. Encores air on Sunday at 0200hrs and Tuesday at 0800hrs on Discovery Travel & Living (Starhub Channel 16). how more fortunate can you get! anyway, the fallopian tubes sound interesting, i doubt i have them before! what a day u had! was he a friendly dude? Bob was such a nice guy, despite our shenanigans. No diva attitude, no airs, and no pretensions. He made us feel at ease. 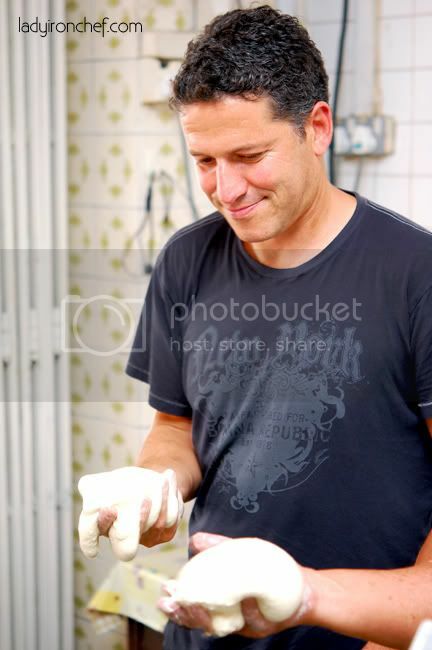 thenomadgourmand: Yeah he’s very friendly and nice, was sharing his experience with us, and very funny too! Camemberu: Yep totally agreed! okay when are we going back? brad, thanks again for helping out on the contact! 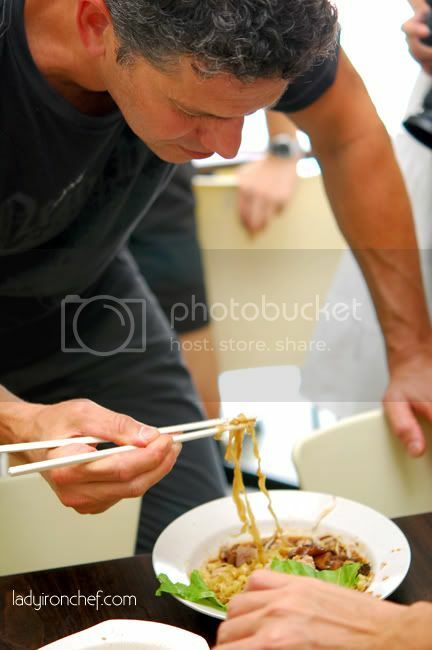 brad+camemberu, food crawl? bring me, bring me! Nic: hahaha no problem dude! yeah when shall we do a food crawl? sounds great! Omgosh you are so lucky! Jor: yep so lucky to have the chance to meet him! Oh yah, the video. OK, I better go find and upload.